Home » Recipes » Desserts » Delicious and QUICK Holiday Treat….Yum! Delicious and QUICK Holiday Treat….Yum! I was browsing around online, looking for Christmas treat ideas. And ack, I found so many delicious ones. Such a dangerous thing to google……beware. There were many I wanted to try but I was really trying to find something that wouldn’t take a lot of time. Then……I found a Brownie Covered Oreo recipe found here, from Picky Palate. Oh. My. Goodness. These should never have been created. They’re kind of sinful. Ha! But I guess that means they’re perfect for holiday indulgences, right? But the moment you take a bite, you’ll know what I mean. I used the holiday candy cane oreo variety to give it a nice minty punch in the center. Wow! The oreo is baked right into the middle of some brownie batter. So you bite into a nice chewy brownie, just the way you like it, but then have a heavenly cookie center. Purely delightful. And so my family wouldn’t eat every last one, I threw some into some colored cellophane, tied some ribbon around it, and gave a few brownie cookie stacks away. And I have mentioned before that I can’t eat gluten. Bummer. 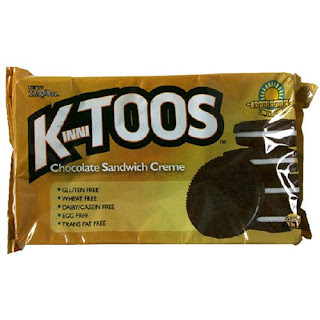 So just as an FYI (especially to my family who can’t eat gluten either)…….I bought the mock oreo cookies by Kinnikinnick to use for the cookie (found in the health food section at the grocery store). 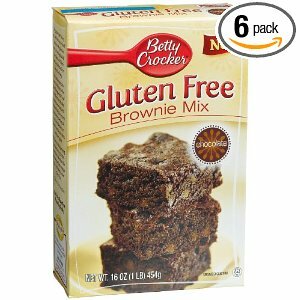 And the gluten free Betty Crocker brownie mix (found with all of the other cake/brownie mixes at the grocery store). I made my husband compare both the “real” and the “gluten free” varieties. He preferred the minty candy cane variety…..mostly because of the mint. But he said the gluten free were just as good as far as texture and overall taste goes. And since they are all I know, they were completely delicious to me. Yum! So go on, grab a few things at the store and throw together your own little treat for the holidays. Personalized Valentine Cards...with a little treat! « His and Her Aprons…….Last Minute Gift Idea?? Sounds yummy! You could always add a splash of peppermint extract to the gluten free brownie mix to get the same minty flavor. Mmmm…..I think I'll try that. Great idea!! Those sound delicious! I am also gluten free! Celiac for 5 years now. As I started reading the recipe I thought I wonder if it would work gluten free and you answered my question! Always nice to meet a fellow celiac! Thanks for the treat idea, definitely trying it. Oh, my, heck. These look divine!!! My husband has Celiac, and so does my MIL and most of their family…now I know what I can make for them! THANK YOU! Looks really good! Probably it is very tasty. Oh my goodness! I loved your website before but now that I know we're both gluten free I've reached a new level of admiration for you and the things you do! My husband is gluten intolerant and I have such a hard time cooking baked goods for him. This might be just his thing! Oh my heavens these look fabulous. I am off to the market right now to make a batch to serve at a party tomorrow night. Thanks for sharing this easy recipe. Looks soooo delicious! And with dairy free "oreos"!!! Oh yum, wish I read this post earlier. Making cake balls at the moment for our neighbors, but would've loved to try and make these. Next time. Thanks for sharing! Ooooo I am SO making these next week! Thank you!! Didn't think it was possible to love your blog any more- but now I do! I made them and they are delightful. I made one batch with mint and one with peanut butter oreo's. Here are my little tips. Don't use shortening on your pan use cooking spray and a bunch at that. They stuck to shortening. Second I didn't have a plastic knife so I dipped my metal one in water between each brownie. Last you don't need much brownie mix on the cookie. If you put to much it looks like a brownie cupcake. Definitely will be making these again. Just went to the link and saw the other FABULOUS recipes!! Thanks for sharing! I teach third grade, one of my students wrote me a sweet card at the end of the year that said "I hope one day they find a cure for silly acts disease" LOL I loved it, I thought of her explaining her crazy zany teacher, who can't help being such a nut, cause she has silly acts disease…lol. Merry Christmas! feliz natal e ótimo ano novo! Muita saúde, paz e felicidade! Those look DIVINE. Unfortunately I'm at home for Christmas and my mother doesn't let us have 'junk food' like Oreos. 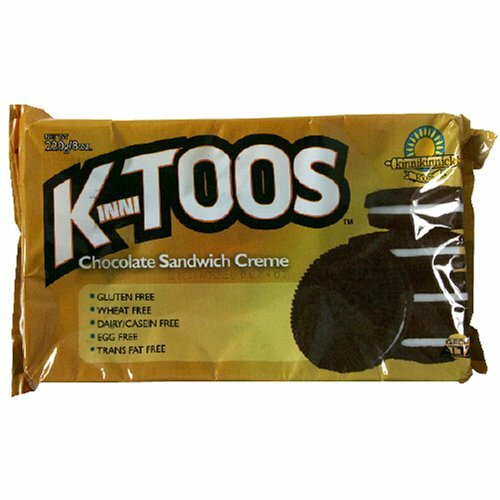 I always ODed on them whenever I could as a child because they were such a forbidden pleasure. Oreos in brownie mix is like a forbidden pleasure times TEN. Thanks so much for sharing this! we have not had oreos here in Germany for over 3 months but as soon as we can get them again I am totaly making these. merry christmas! OMG hook me up FAST!! hello, your blog enchants to me, I am new, also follows my blog, I hope to you, goodbye. Thanks so much for this FUN and easy recipe- my daughter and I made them but we couldn't find your red colored cookies so we used the green MINT ones- what a hit at our family Christmas gathering! Mouth-watering! Yummy… thanks for sharing! I am gluten free as well, my sister made these exact treats a few weeks back. Her family is gluten free as well! Check out her blog…. Yum! I think I will try that next week! Not that we didn't have enough treats during holidays! I love your pictures too. LOVED these. For years my uncle and I have exchanged oreos as Christmas gifts. I wanted to do something a little different this year and this was the perfect solution. If the boyfriend hadn't eaten the rest of the oreos I would have made some for myself too! I've been out of the loop for a while. These look positively sinful, and oh so yummy! oh what a yummy idea! THIS is realy Yummie! have to try these!!!! As I'm sitting here salivating over your pictures I got a little sad that you said you used Oreos, as I've recently been diagnosed with Celiac. And then I got to the end and did a happy dance. Hooray! Yummy goodness for those of us who usually have to say no. So thanks for posting this! I am just learning to eat gluten free. I would love to know about some of the things you love! Thanks for sharing the GF option!! So great. Just made these some stuck even though I used a lot of cooking spray. Next time I will cut parchment paper to put in the bottom. Also may try the peanut butter oreos and melt peanut butter chips to drizzle on top. Was dissapointed some stuck next time I will cut parchment paper circle to line the bottom of pans but they are very good. Can’t wait to share at school tomorrow. My try the peanut butter oreos and drizzle peanut butter chips melted on the top of those. Amazing! This might be the most genius thing ever! And they’d be the perfect holiday gifts! Mmmm….looks delicous! Reminds me of whoopie pies!